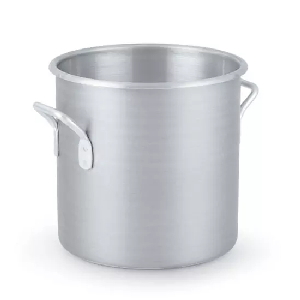 If you've invested the money necessary to obtain a set of quality aluminum cookware, it's important to take care of it so that your pots and pans last as long as possible. 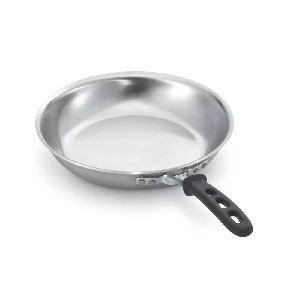 With proper care, aluminum cookware can last for several years of sustained use, but like any material, it requires specific maintenance to remain in tip-top shape. Use this guide to learn more about how to clean aluminum and get the most out of your cookware. Like with cast iron, aluminum cookware should be seasoned before being put to use. Proper seasoning will help the aluminum keep its color longer. Prior to first use, wash the new equipment with warm water, a delicate scrubber, and mild soap. This process removes any polish or debris that might have accumulated during storage and shipping. Rinse and dry the dishware. Apply a small amount of oil to the inside of the pot or pan and heat the oil as hot as possible before it begins to smoke. Apply more oil and heat. Apply oil for a third and final time, then heat the pan. Allow to cool, then wash with cool water. After following these steps, your cookware will be well seasoned and ready for action. 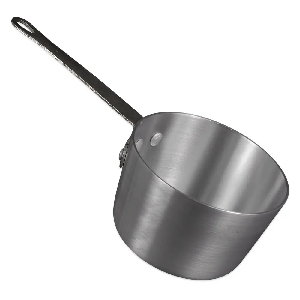 Aluminum cookware is popular with chefs because it is a relatively good heat conductor, which means it heats evenly when cooking. Even heat prevents dishes from burning in some spots and being undercooked in others. Stainless steel heats less evenly than aluminum, so many stainless steel pieces have aluminum or copper bottoms to better transfer heat. However, aluminum does have a few specific care requirements to follow while cooking. Highly acidic foods can wear on cookware over time. 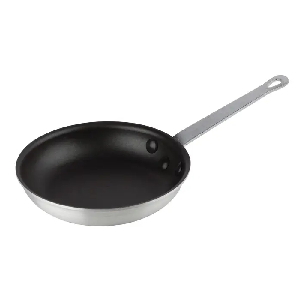 Clean your aluminum pots and pans thoroughly after cooking highly acidic foods, and do not use them to store food. Because aluminum transfers heat well, chefs typically do not need high heat to cook with aluminum pots and pans. High heat has the propensity to discolor aluminum pans, and chefs should use only as much heat as is necessary to cook the dish. Similarly, do not cook over ranges that are broader than the bottom of the pan since they can also discolor your cookware. Staining and messes can't be prevented while cooking, but with the appropriate cleaning methods, you can restore your aluminum cookware to its original sheen. 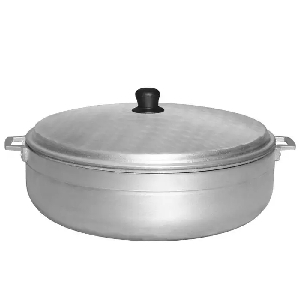 Since pots and pans encounter different problems in the course of kitchen use, each type of cookware has specific care recommendations. After cooking, use warm water and a mild detergent to clean your aluminum cookware. This detergent should be gentle enough that you can use it on your hands, so no oven cleaners, bleach, or other harsh chemicals. Do not use a dishwasher to clean your aluminum cookware. Dishwashing detergent is stronger than the recommended cleaners, and some dishwashers are rough enough to scratch your cookware, especially if it has a nonstick coating. Discolored or stained aluminum can generally be restored with a mild aluminum cleaner. 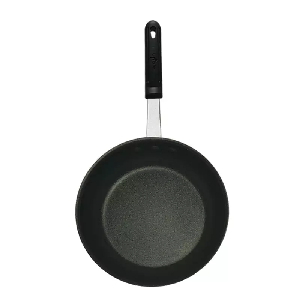 These products can remove stains without affecting the quality of food prepared in the cookware. Consult the documentation for your aluminum cookware for specifics on how to clean aluminum. Depending on the coating and finish used by individual manufacturers, best practices may vary. Boiling water can leave discoloration and mineral residue on your pots. Here are a few tips on how to clean aluminum pots that should keep yours looking new. Water can leave mineral buildup on the inside of pots that can be difficult to clean. The best way to prevent this buildup is to use a soft cloth to dry the pot after cleaning. Tough food stains or residue can be cleaned by boiling a mixture of water and vinegar, which will loosen the stains. Wash with cool water and pat dry. Mineral buildup caused by alkalic food can be cleaned by cooking acidic foods or by using a mild aluminum cleanser. 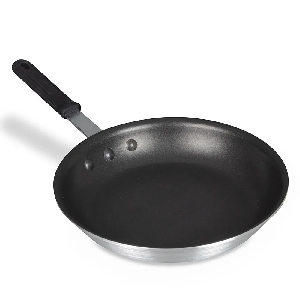 Pans with nonstick protective coatings must be treated with care. We'll go over a few tips on how to clean aluminum pans here. Wash aluminum pans with warm water and gentle soap. Do not leave food residue on nonstick surfaces for long durations, as food acidity could degrade the coating over time. When using aluminum pans with a nonstick coating, be careful not to use materials that might scratch the coating, such as metal utensils. Wooden and plastic utensils are generally safe to use on nonstick coatings. 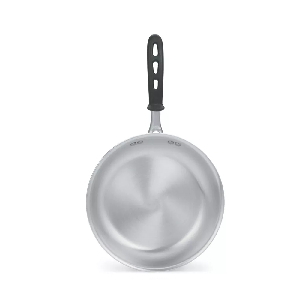 Consult specific product instructions when using aluminum cleaner on nonstick pans. Chemical cleansers could react with nonstick coatings and damage the surface. 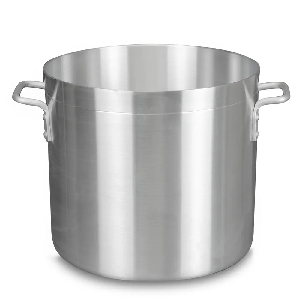 Use care when storing your aluminum cookware, as excessive force in retrieving the cookware could end up scratching or denting it. Aluminum is not as sturdy as stainless steel and can be bent or scratched more easily. Consider lining aluminum pans with cloth or other soft materials during storage to provide a buffer between the pans and other cookware, especially if the pans have a nonstick coating.